Jessica Chastain has signed on to star in Universal Pictures' The Huntsman, a follow-up to 2012's Snow White and the Huntsman. While Kristen Stewart will not be back as Snow White, Chris Hemsworth and Charlize Theron reprise their roles as The Huntsman and Ravenna. No details were given for Jessica Chastain's role at this time. Deadline also reports that Emily Blunt, who was being eyed for the villain role last month, has finalized her deal. 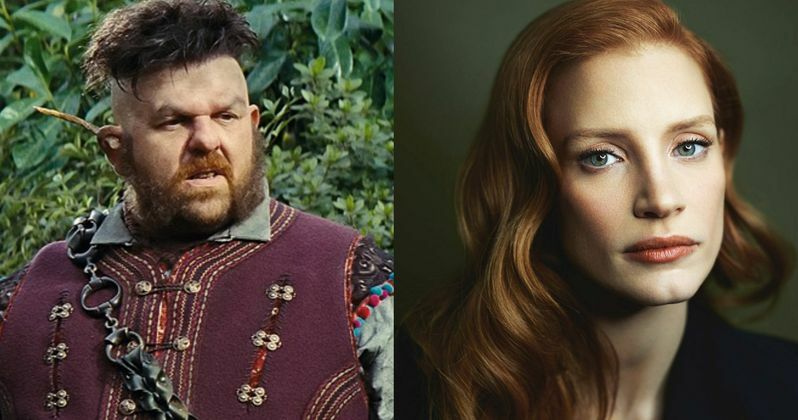 Snow White and the Huntsman star Nick Frost is also coming back to reprise his role as the dwarf Nion. We reported last month that Nick Frost and Toby Jones couldn't come to terms with Universal about reprising their dwarf roles, and that Eddie Marsan is also not returning due to scheduling complications with Ray Donovan. The site now reports that Nick Frost and Universal "have worked it out" for him to return. Cedric Nicolas-Troyan is directing from a screenplay that was worked on by Frank Darabont, Craig Mazin and Evan Spiliotopoulos. Joe Roth is producing with Palak Patel executive producing. It isn't known when production may get under way. Jessica Chastain is coming off roles in The Disappearance of Eleanor Rigby, Interstellar and A Most Violent Year. She will next be seen in the haunted house thriller Crimson Peak, and she is currently shooting The Martian alongside Matt Damon.